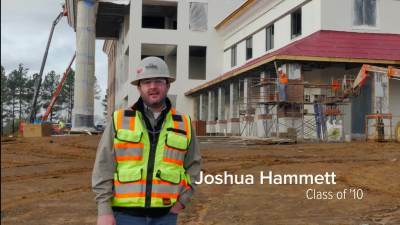 Joshua Hammett, 2010 construction management graduate, is an assistant project manager with Nabholz Construction. Good morning, my name is Joshua Hammett with Nabholz construction! I'm an assistant project manager. We're out here at the Arkansas college of osteopathic medicine. Come on, let's go take a tour! Five years ago, I started out with Nabholz as a project engineer. From that point, I moved into a role that's called virtual construction coordinator. Our team has been extremely successful. A lot of our customers and clients are repeat, John Brown being one of them. And we love doing work for them. I have a set of skills that very few people have, and Nabholz has been great, allowing me to learn and perfect that. I'm not an electrician, I'm not a plumber, I'm not a mechanical contractor. What I do is I know how to bring those guys together. How to communicate it, how to document it. That's what a project manager and construction manager does. I had a great base of knowledge that I picked up from John Brown. I mean it's hard to beat professors that have had the experience and they've got the years. And in the CM Department, where it's a lot smaller as far as the population in there, you’re, you're family. And I don't know that you get that at every program.